Simultaneously record both image and temperatures at 64 points while viewing the object being measured! Sharp, bright, high-visibility TFT color LCD monitor. The OS-XL has been discontinued, please see the OSXl-TIC Series or the OSXL-EX as possible substitutes or consult OMEGA's Temperature Engineering department. This product has an Interactive Showcase. Click on the icon to the left to experience it. The OS-XL displays an image of the measured subject and the temperature distribution at 64 measurement points. The most advanced temperature gage—brought to you by OMEGA™ The OS-XL is a 2-dimensional infrared thermometer equipped with a newly developed 64-element thermopile array sensor. The OS-XL is not just another non-contact temperature measurement device–the OS-XL allows the user to view and verify the measurement subject on the LCD screen while simultaneously measuring the temperature at 64 points. 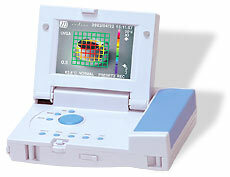 The OS-XL can actually display and save data with a graphic representation of the temperature distribution overlaid on an image of the subject being measured. Furthermore, device operation is extremely easy, similar to that of a digital camera, greatly increasing operation efficiency. The OS-XL offers exceptional functionality that has never been available before at this amazingly low price. Combining OMEGA’s original technologies and concepts, the OS-XL takes the lead in the field of temperature measurement. A thermopile is the heart of most of today's leading infrared thermometers. The Thermopile Array consists of a matrix of multiple thermopile elements, but attempts to put this technology into practical application have been hindered by size and sensitivity problems. OMEGA has managed to overcome these problems using semiconductor processing based micromachining, successfully developing a micro-size, high-sensitivity thermopile. The resulting 64-element Thermopile Array consists of an 8 x 8 matrix of 0.5 mm2 (0.02"2) elements, the first such matrix in the world to be put into practical application. The true value of the OS-XL lies in its ability to display temperature distribution on an image of the measurement subject. The image of the object being measured is divided into a 64-frame grid. The temperature distribution is displayed in corresponding colors on the grid lines framing each area. Temperature is measured in each frame. The cursor can be used to select a specific frame in order to display the temperature for that area in 0.1° increments. The OS-XL provides easy operations for both measuring and recording data. The OS-XL also provides a diverse range of settings functions and data options supporting "smart temperature measurement" with its enhanced functionality. All recorded data is saved on a Compact Flash (CF) card. The OS-XL saves data in formats that can be easily edited by computer. The data saved on the CF card can be read by most computers. It is easily viewed and edited without using specialized software. With Microsoft Excel, the image and measurement data can also be analyzed and used to generate illustrated reports. Easy Operation, with the Feel of a Digital Camera In addition to making measurements, the OS-XL also makes it easy to save data—just line up the object being measured in the LCD monitor and press the "Save" button. The lightweight, compact body of the OS-XL makes it an exceptionally convenient measurement device. Caution: This product and all in the series are not for use in medical evaluations. These products cannot be used to measure body temperature. They are meant for industrial and scientific purposes. 참고: Unit comes complete with 16MB Flash Card, Flash Card reader, hand strap, 6 AA alkaline batteries, AC adaptor, carrying case, video cable and complete owner’s manual.